This is a collection of 12 tracks of GZA remixes from his classic material behind heavy samples of classic and hard to find Ray Charles albums, with all production done by Gutter Water Music's own Dysposable Heroes. This is a concept remix project with no ties to the artists or their respective labels, estates, etc. and is for promotional use only. Please burn this and give it to anyone you think might enjoy it! 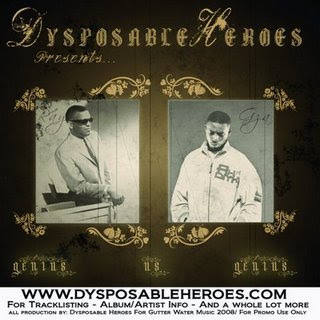 Listen to track 8, "Fame To My Soul"
NOTE: Download link will take you to the Dysposable Heroes website where you can find the link, when you click on the DOWNLOAD tab!